Google is a vast web search engine, there is no doubt in that. We search the web on a daily basis to find out desired things we need. 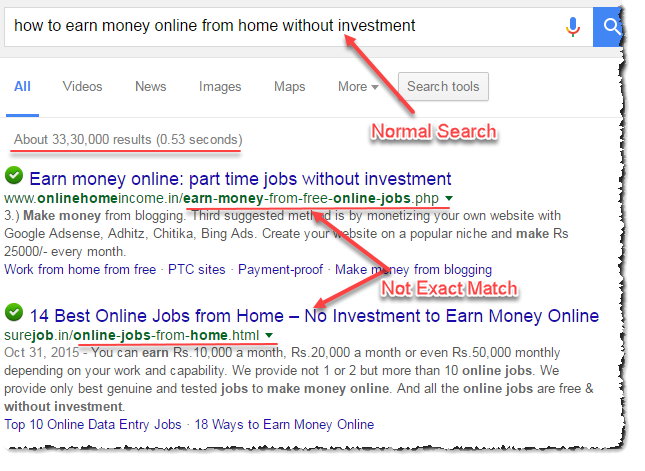 And as soon as we enter something in google search box, we find lakhs of web pages within a blink of an eye, isn’t it? And then the actual search begins, to find out the desired answer among tons of web pages. Here the actual web search skills required. Web Search Skills: Now what is that? We get the answers and we close the browser, but it doesn’t happen all the time. Seldom we need to spend more of our valuable time to get the right one. Because among so many web pages some of the searches which use to related to the topic and some not at all related. So if the web pages are not related to we need to spend more time on the search engines to get the exact answer what we ae looking for. So why not to narrow the search a bit more, agreed? If the answer is yes, then lets us go ahead and find out few tricks to do the same. So let us see how to narrow the web search with semi columns (” “). Typing our text in between the two semi-columns will give you the exact search result you are looking for. time-consuming Web Search – Below in the example of a search without semi-columns, where we are not able to find the exact search results of what we have entered into the search box. 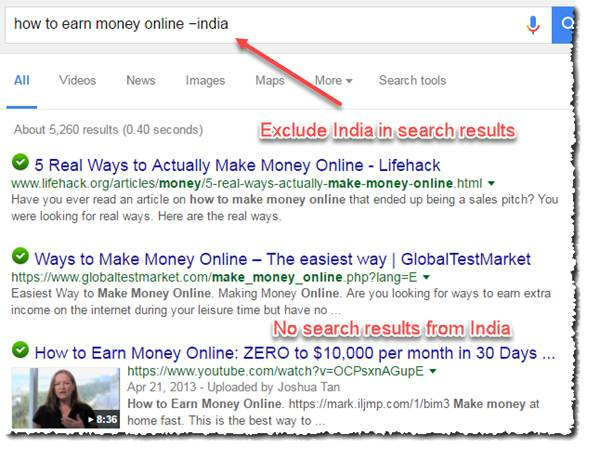 I am making a search here “how to earn money online from home without investment,” which is the most popular search criteria in google, where we could found around 33,30,000 results for the same and moreover the search results are not exact what we were looking for. Some keywords were jumbled here and there. We can see a better insight in the below image. Search with Semi columns ” ” – After entering the desired text in between the semi columns (” “), we will be able to get the same results exactly what we are looking for. And Moreover, the searches results will be more filtered out. As we can see in the image below the searches are showing around 716000 only. 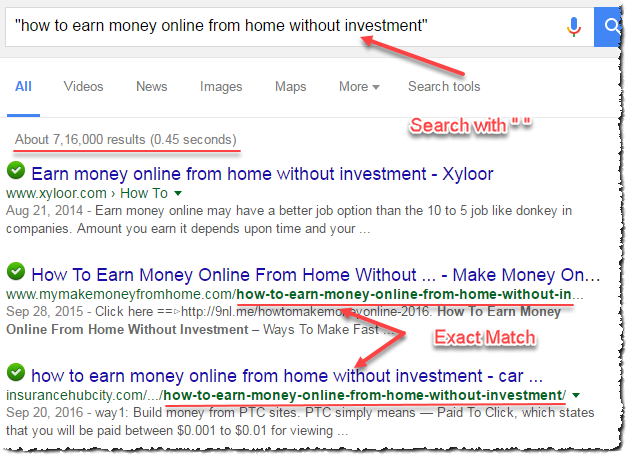 Which is the big difference compared to the above search without semi-columns around 3330000. So in this way, we have filtered out a lot of web pages and the searches can be done much faster. Following this way, we could be able to save more time as we get the results quicker. Sound weird? Those who are scared of mathematics while schooling might feel a little scared. As we are supposed to discuss here how to search better in search engines, then why some (+ -) mathematics coming into this. Relax folks we are not getting into mathematics anymore, even I am scared of it. By using (+) we can indicate that particular website or a word is important for me. And we want the search engine to display results only which are related to that particular word. 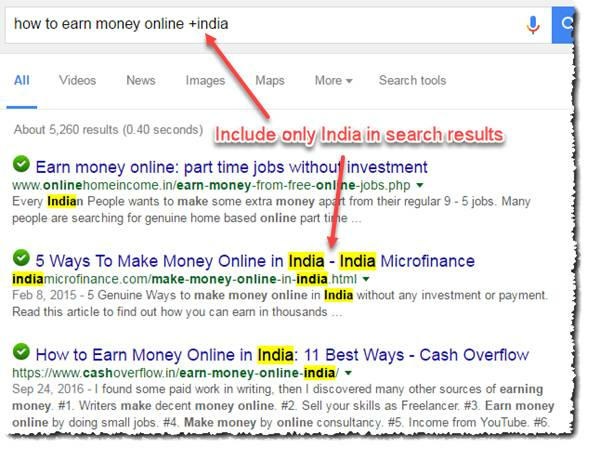 For Instance, in the below image, I have entered “How to earn money online +india” again. We have again tried to narrow the search results by adding (+), and doing so as we can see that in below image, only the search results which are related to the word (India) after (+) sign have been displayed. Here in the below image, we have excluded a word, by entering (-) sign before it. And the search engine determines that and would not be displayed those web pages which are related to that particular word. Not only with any particular country, you can try this with anything. This way we can refine the searches better and could save a lot of time. The next search criteria are an interesting one as we all do this very often. These search criteria can be used when you want to search something from one particular website only. which you trust the most. For and instance if you are looking for a smartphone and you regularly buy from the same website, because of your past good experiences. And you want the search engine to find your desired search with that website this time as well. Doing that, all that particular phone data (websites) will be displayed in the search engine. In this way, you can avoid the other websites. I just gave an example of the phone, we can do it for anything. Many of the times we look for tutorials online, for downloading a step by step guides for learning something in a particular format. We need our tutorials to be in a particular format file only for whatever reason. Like .PDF, DOC etc. So at that certain point, this criterion could be very useful, instead of going through all the web pages and finding the required one, we can filter only those web pages which contain only that particular desired format. For an instance, someone wants to learn some CSS Coding, and they required the step by step guide in PDF format, in that case, the search criteria would be. You can get the better insights in the below image. Above all are the very effective ways to refine the searches better. Give a try to these and let me know your experiences on the same.